Is your website holding you back from success? Increase your website’s traffic and sales by avoiding these 7 common SEO mistakes. Need Some Help With Your Website’s SEO? The competition for search engine rankings has never been higher, and for good reason. Over 90% of consumers don’t even look past the first page of search engine results! While everyone wants their website to be at the top of search engine results, most small business websites have small errors that are preventing them from getting there. With that in mind, we decided to compile a list of the 7 most common SEO errors we are calling the 7 Deadly Sins of SEO. Why SEO is important for your small business. How search engine crawlers see your website. The 7 most common SEO errors that keep small businesses off the top of search engines. 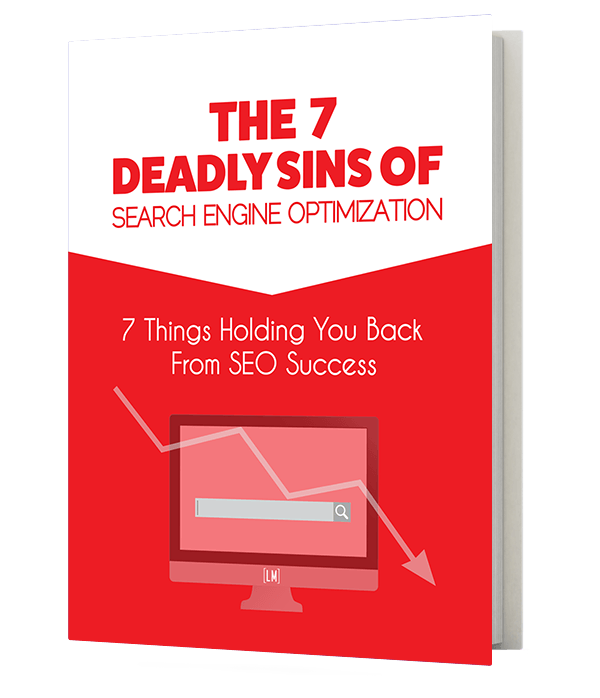 To get your free copy of The 7 Deadly Sins Of SEO simply fill out the form below. You will then be redirected to a page where you can view it. You will also be e-mailed a copy. Search engine optimization (SEO) is the process of optimizing a website to be easily understood by search engines. The better a search engine understands a website, the better it will rank in search engine results pages (SERPs). The better a page ranks in SERPs, the more consumers will see and click on the website, without advertising. This increased website traffic is the reason SEO is seen as one of the best and most cost effective ways to grow a small business. Most consumers nowadays look to search engines to find information on products and services they wish to purchase. In fact, a 2012 survey by Fleishman Hillard found that 89% of people use search engines to help make purchasing decisions. If you’re website isn’t on the results pages of their search, your business is at a big disadvantage. Search engines work by sending out millions of automated robots (known as “spiders” or “crawlers”) to find and decipher webpages. These crawlers follow web-links between websites and document each web page they come across. Information about these webpages is then indexed and stored in the search engine’s archive. Web pages are indexed by keyword and stored in a database with similar web pages. When a consumer search includes that keyword the websites in that database are eligible to display. The order in which they are displayed depends on how relevant the search engine’s ranking algorithm believes the web pages to be. The webpage ranked as the most relevant is placed at the top, followed by the next most relevant and so on. One of the most common questions we get at Lure Marketing is "how can I get my website to rank higher in search engines?". During our free analysis of these websites we consistently see the same mistakes being made. For that reason we decided to compile the most common, and most damaging, of these mistakes into our 7 Deadly Sins of SEO. When determining what a web page is about, search engines first look at the URL of the webpage. Including keywords in the folders and paths of your URL help to rank your pages in relevant searches. To demonstrate this let’s consider a bike shop in Toronto. Let’s say that they are creating a web page for their new mountain bike. Which URL do you think would help the SEO of their new page “www.torontobikes.ca/new-mountain-bike” or “www.torontobikes.ca/product-2235?”. Of course the first one will help more with SEO as it gives search engine crawlers more relevant information about what the page content is about. While this may seem obvious, popular Content Management Systems (CMSs) like WordPress will default to using URL structures similar to the second example. These defaults can, and should be changed to allow you structure your URLs manually. Not doing so is a basic SEO sin that will cost you website traffic.